If you are suffering from Irritable Bowel Syndrome (IBS) and/or Small Intestine Bacterial Overgrowth (SIBO), there’s a good chance that your doctor will talk to you about Xifaxan. 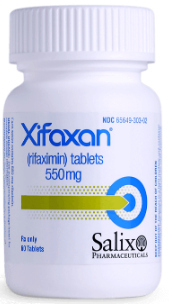 Xifaxan is the brand name for Rifaximin and is produced by Salix Pharmaceuticals. Xifaxan is an FDA-approved drug for treating the symptoms of IBS-D. It’s an antibiotic that alters your gut bacteria with a goal of reducing your symptoms of IBS. You take Xifaxan three times a day for two weeks. It can be taken with or without food. According to the drug company, the average relief in a clinical study was 10 weeks, but it can provide up to 6 months of relief from IBS symptoms. Because it’s an antibiotic, you’ll want to discontinue any probiotics you take while on the medicine. The antibiotic will kill the probiotics. You can recommence the probiotics after completing the treatment. Xifaxin is available only by prescription. You should consider speaking to a Gastroenterologist (a doctor that specializes in the digestive system) to discuss if Xifaxin might help you. The drug is not cheap and could cost close to $1,500. In my case, the Gastroenterologist referred the prescription to a specialty pharmacy that works with insurance companies to get coverage approval. They were able to get approval from Aetna within about a week. By combining the insurance benefit with a special program from Salix Pharmaceuticals, my out-of-pocket cost was zero. While I didn’t get the drug as easily as going to my normal pharmacy, it was well worth it. I started seeing results within just a few days of taking Xifaxin. The biggest change was in my stool, which became more regular in appearance and softness. The change in my stool remained for a week or two after finishing the drug. But that wasn’t the change I was looking for–the main thing was relief of gas, constipation and other symptoms of IBS and SIBO. I have been able to tackle these by combining Xifaxin with a low FODMAP diet. I thought of Xifaxin as a way to jump start my new diet and the relief it could deliver. I don’t want my symptoms coming back every few months. Although you can take Xifaxin for up to three courses, I want permanent relief. It’s been nearly six months since taking Xifaxin, and I’m a believer. But it’s important to stress that a big part of this (and keeping my symptoms from coming back) is changing my diet to reduce FODMAP intake. ← What is SIBO (Small Intestinal Bacterial Overgrowth)?